Everyday ethics emerges, by definition, against the background of ordinary practice. On a typical day, Eastside Services staff members make innumerable decisions about the right course of action for their clients. To do so, they must pose and then work through several questions. What does my client need, given what I know about his personality, his strengths and vulnerabilities, and the way he lives with his symptoms? Can I cobble together the resources to answer his need? Is there a standard, routine way to handle this sort of case, and can I conceivably follow it with the person standing in front of me? But then they face the hard surfaces of the job: scarce resources, dilapidated housing, opaque bureaucracies, rigid agency policies, and indifference or disdain from other public service workers (police, probation officers, hospital staff, and welfare officials). These obstacles prevent the case manager from carrying out her preferred course of action. Everyday ethics is the label for commentaries that emerge at this stage about right and wrong, the obligatory and the forbidden, and the legitimacy of professional power. Front-line clinicians enter this collision zone between the desirable and the possible when they discover that their knowledge and training are not enough to carry out the right decision, given the background structures of their job. Staff members do not know, because they do not need to know, that all these structures have a history. Clinician and client do not stand face to face on a featureless plain, as generic healer to sufferer. A particular institutional history has produced the way they come to meet, the balance of power between them, and the social worlds they jointly negotiate. As a result, when blockages in work provoke clinicians to talk about right and wrong, they do not speak as generic ethical agents. They speak instead from their partial perspective, traversing the permanent, if buried, features of this particular landscape of practice. In the end, everyday ethics is historically produced, but in ways largely invisible to clinicians themselves. To understand today's dilemmas requires tracing the tangled past of this mode of treatment. The shape of action for front-line providers is a layered domain where the outcome of prior policies and ideologies is woven in today's ordinary work routines (cf. Rhodes 1993). The relevant past includes the deinstitutionalization of psychiatric patients starting in the mid-20th Century, the tragedies left in the wake of this broad social movement, the new models of community-based services that arose as a response, and the diffusion of these models across American mental health services. Each strand in this genealogy informs the everyday ethics that emerge at the clinical front line. Deinstitutionalization in the United States occurred at the confluence of several distinct trends1. During the late 19th Century, the number of patients at state mental hospitals graduate rose due to urbanization and immigration. The rising censuses pushed such institutions away from their founders' optimism and the humanistic goal of "moral treatment." By the first few decades of the 20th Century, most state hospital patients were confined for years, if not their entire lives, and received little more than custodial care. Outrage over the crowded and deteriorated conditions flared up during the 1940s in popular books, magazines and films. These high-profile exposes made the mental hospital a symbol of hopelessness and neglect for the broad American public. At the same time, the professional commitment to hospital-based care also started to erode. Psychiatrists wanted to align themselves with the therapeutic revolutions sweeping through the rest of medicine and were eager to sever their long-standing exclusive association with custodial institutions. Psychiatrists' experience in World War II also fueled their enthusiasm to relocate patient care outside of hospitals. They discovered that the early diagnosis and treatment of soldiers' mental disorders near the battle-front and in soldiers' own social milieu often had better outcomes than the standard services delivered in remote hospitals. The experience of treatment soldiers in non-institutional settings became an alluring model for psychiatry as a whole. At the national level, vastly increased public investments in medical research also laid the groundwork for deinstitutionalization. During the immediate post-war period, the mental health system as a whole was reshaped by a new enthusiasm for federal health policy initiatives. With the establishment of the National Institute of Mental Health in 1949, policy makers and leaders of academic psychiatry began to conceive of mental illness as a public health problem, amenable to high-level systemic interventions. The architects of mental health policy aimed professional services at a broader population, including both in-patients and out-patients and with mild to severe symptoms. The public health perspective produced the paradigm of community mental health, which envisioned a dispersed, nation-wide network of small out-patient clinics to replace the large, centralized state hospitals. Other mid-century developments, both technological and ideological, made the large state mental hospital seem "antiquated, outmoded... and obsolete," in the words of the 1958 presidential address of the American Psychiatric Association. In 1954, the first phenothiazine drugs were introduced into American hospital use. Chlorpromazine, marketed as Thorazine, had the dramatic effect of calming belligerent and loud patients and making it easier to discharge them without opposition from family members or neighbors. The expanding arsenal of antipsychotic medications (such as Halperidol, introduced as Haldol in 1958) justified the goal of emptying the back wards and re-integrating long-term patients into society (see Gronfien 1985). Ideological shifts of the era also endorsed the vision of non-institutional care. Sociologists criticized long-term psychiatric hospitalization as inherently humiliating and an assault on personal dignity (Goffman 1961, Belknap 1956). Within professional psychiatry, reformists shared in the early 1960s idealism about improving society through government programs. At a time of federal interventions to end segregation and combat poverty, a top-down recipe for re-figuring mental health services was enormously attractive. The federal government seemed better equipped than the states to solve social problems, including the provision of mental health services. In 1961, an NIMH working group predicted that new community mental health programs, combined with public education to reduce the stigma of psychiatric illness, would make "the mental hospital as it is now known to disappear from the scene in 25 years" (quoted in Grob 1994: 253). This book explores the moral lives of mental health clinicians serving the most marginalized individuals in the US healthcare system. 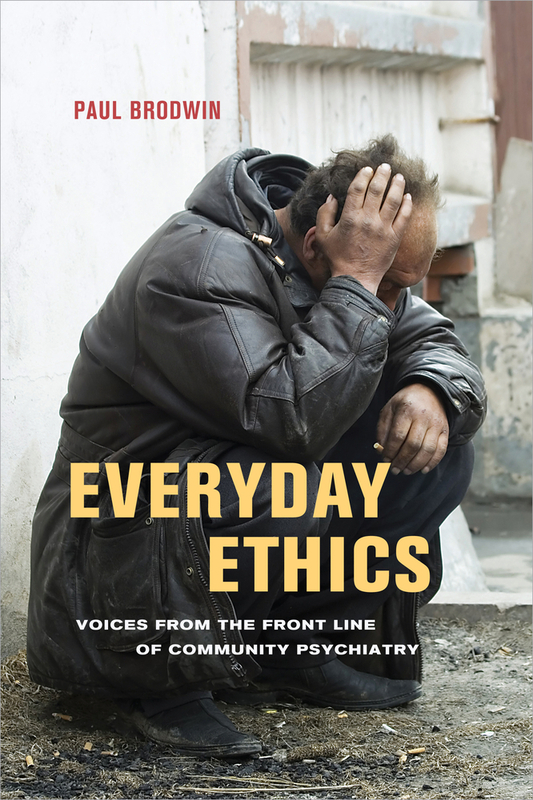 Drawing on years of fieldwork in a community psychiatry outreach team, Brodwin traces the ethical dilemmas and everyday struggles of front line providers. On the street, in staff room debates, or in private confessions, these psychiatrists and social workers confront ongoing challenges to their self-image as competent and compassionate advocates. At times they openly question the coercion and forced-dependency built into the current system of care. At other times they justify their use of extreme power in the face of loud opposition from clients. This in-depth study exposes the fault lines in today's community psychiatry. It shows how people working deep inside the system struggle to maintain their ideals and manage a chronic sense of futility. Their commentaries about the obligatory and the forbidden also suggest ways to bridge formal bioethics and the realities of mental health practice. The experiences of these clinicians pose a single overarching question: how should we bear responsibility for the most vulnerable among us? Paul Brodwin is Professor of Anthropology at the University of Wisconsin-Milwaukee and Adjunct Professor of Bioethics and Medical Humanities at the Medical College of Wisconsin. He is the editor of Biotechnology and Culture: Bodies, Anxieties, Ethics, author of Medicine and Morality in Haiti: The Contest for Healing Power, and coeditor of Pain as Human Experience: Anthropological Perspectives.